Regardless of the heated feud on twitter between American singer Nicki Minaj and her former boyfriend, Safaree, the 35-year-old has been busy promoting her new album ‘Queen’ as she stopped by at Total Request Live to perform on Wednesday. The ‘Ganja Burn‘rapper showed off her exquisite style by wearing a tiny white bodycon dress which she paired with fringed Saint Laurent boots with stiletto heels during her stop by the MTV show. 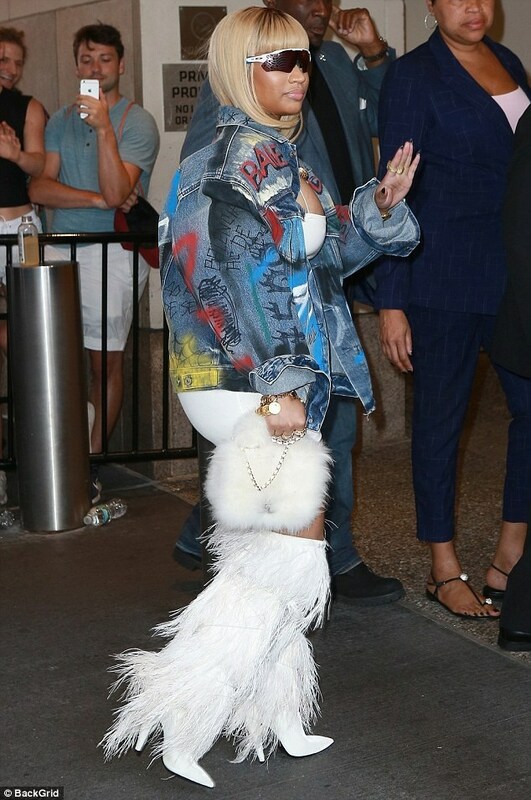 Minaj Completed her look with a custom Balenciaga jacket, wrap-around Oakley shades and carried a fur bag for the outing.